Situ Biosciences offers the highest sensitivity and fastest possible microbiological testing with FAST Technology. Microorganism Abundance tests are often used in the energy production sector and personal care products industry for quick and reliable assessment of microbial abundance in many different types of formulations. Testing plays an important part in ongoing certified Quality Control programs and Lot Release Quality Checks before products make their way to the end-consumer. Many of our customers utilize testing to assure that their line and batch products conform with formulation and microbial requirements. 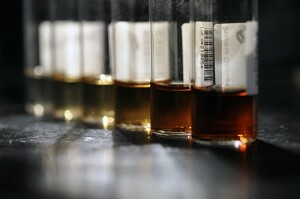 Having a fast and reliable Quality Control program can aid in determining the efficacy of an antimicrobial in fluids. In addition, Situ Biosciences’ can perform ultra low detections of microorganisms. Situ Biosciences, specialist in innovative microbial testing, can provide sample testing and reports in as little as 4 hours, and not longer than one day. Customers commonly request testing for fuel, oil, personal care and pet care products, lubricants, cleaners, paints and coatings, and metalworking fluids. *FAST reporting is available for QC program participants and does require a onetime formulation setup for certification. For more information, please contact our products test laboratory at 847-483-9950 or info@situtest.com.